Sadly, one major challenge in Nigeria – South Africa relations over the years, beyond the recent violent attacks on Nigerians and other Africans, is the lack of mutual diplomatic and tactful reciprocity on the part of the South Africa government and the country’s non-state actors for the strategic role Nigeria played in the struggle against apartheid. Moreover, this is why Nigerians are angry at the latest attacks. The wave of violent attacks on the African foreign population living in South Africa has generated local and international condemnation. This article examines the core issues of racial intolerance and dislike for foreigners, particularly Nigerians in South Africa, within the broader historical framework of the apartheid regime and the post-apartheid socioeconomic relations, which have over time shaped the existential notions of false community, vague entitlement and empty sense of belonging amongst a number of black South Africans. It further highlights and provides fresh perspectives to addressing reverse migration and building a positive foreign policy template in Nigeria that promotes genuine national pride and national interest. It argues that the provision of a national welfare scheme from the President Muhammadu Buhari administration at home for the average Nigerian citizen will help to restore hope for young Nigerians waiting to migrate in search of greener pastures, ensuring that they would not be caught up as victims of xenophobic attacks in South Africa or death in obscure Asian countries. Indeed, the issue of xenophobia in contemporary South Africa in my view is profound psychosomatic carryovers and the negative product of the apartheid regime that cannot be wished away from the collective consciousness of the people of the rainbow nation. This is even more so, given the attendant dispossession of their heritage and personal pride by the despicable and repugnant apartheid regime, which exploited them in their own land. The reality of these historical facts has continued to obstruct the wheel of progress and development. The political crisis of that dark era led to social dislocation, which in turn affected their economic means, educational advancement and developing the required skill sets that would have prepared them for high-level jobs and proper integration into a new South Africa promising a brighter future. 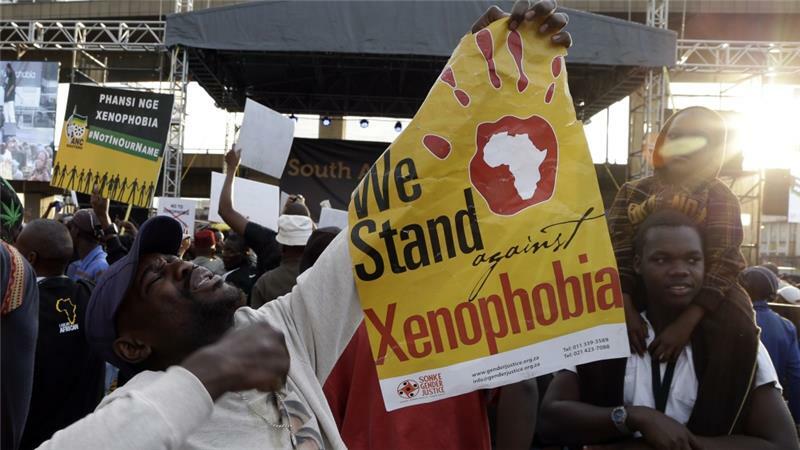 Xenophobic violence is not a new phenomenon in post-apartheid South Africa. Indeed, the sudden explosion of violence has been attributed to a combination of factors which include local political pressures over time, increases in prices of basic goods and high levels of unemployment estimated at 25 percent. Furthermore, there are growing concerns and frustrations at the inability of the South African government under incumbent President Jacob Zuma to provide essential services to poor people, resulting in economic hardship and tensions surrounding crime and competition over scarce resources by the non- national population. The continued socioeconomic issues are pushing the average South African into extreme poverty in the midst of plenty and there is a high level of dissatisfaction with the scheme of things after the fall of the apartheid regime. It would be recalled that in May and June 2008 there were 135 separate violent incidents that left 62 people dead, at least 670 wounded and unfortunately, dozens were carnally assaulted and many properties destroyed and looted. In addition, the South Africa domestic environment has been hostile to non- nationals in particular, as well as undocumented migrants. There is an implicit culture of impunity, which encourages mob justice in most communities. Interestingly, South African state security institutions such as the police and immigration services show no sympathy to black settlers from other African countries; the xenophobia appears institutionalised. Therefore, Nigeria’s international diplomacy should not dwell much on the criticism of the recent xenophobic attacks in South Africa, but rather much attention should be placed on understanding the dynamics of international politics, which is a game of selective morality, outrageous paradox and double standard. Hence, concrete efforts should be made at home to culture an enabling environment that would create jobs and livelihoods for the common people in Nigeria. Nigeria must rejig her diplomatic institutions to engage the South African government. It is important to note that people migrating in search of safer and more prosperous living conditions is the right of any person, as enshrined in the 1948 Universal Declaration of Human Rights and the 1965 International Convention on the Elimination of All Forms of Racial Discrimination. While it is not possible to eliminate social tensions in any country, it is expedient on the part of the South African government and its nationals to respect universal and regional treaties, declarations, norms, protocols and conventions rather than resort to barbarous acts that have outraged the conscience of Africans and indeed Nigerians. Indeed, the unwholesome politicisation of migration as an excuse for xenophobia in South Africa must be addressed by diplomatic means by both countries. The issues and factors of migration that include increased unemployment, poverty and greed must be stopped in re-tooling the new Nigeria- South Africa partnership. Both countries must promote and sustain protection mechanisms for human rights and conducive environments for decent work by migrant workers and their families whether documented (economic) migrants or undocumented migrants. Sadly, one major challenge in Nigeria – South Africa relations over years, beyond the recent violent attacks on Nigerians and other Africans, is lack of mutual diplomatic and tactful reciprocity on the part of the South Africa government and the country’s non-state actors for the strategic role Nigeria played in the struggle against apartheid. In addition, this is why Nigerians are angry at the latest attacks. Nigeria played a frontline role in ensuring freedom for black South Africans through the mobilisation of international opinion to isolate the apartheid regime in the global community, business and sports. Nigeria has also provided a robust unrestricted market for South African companies. Therefore, Nigeria must also forge strategic business alliance in South Africa to balance the business equation. Beyond the existing skewed bilateral and economic relations in favour of South African businesses in Nigeria, there is an urgent need for both countries to initiate a liberalised migration regime and a robust migration management capacity, in order to enhance and strengthen the strategic role of Nigerians in the diasporas as a development partner by factoring their contributions to the overall Africa development agenda for sustainable peace and security. The two countries are not exploiting their leadership and governance roles in sustaining the African dream and indeed the drive for poverty eradication through the Millennium Development Goals (MDGs). Indeed, South Africa and Nigeria, representing the two leading economies in Africa, must play leading roles in driving a sustainable green revolution that would provide food security thereby contributing significantly to overcoming hunger and social tensions that have fuelled African emigrations. It is imperative for the new government under the leadership of Buhari to escalate and maintain key external relations that are mutually beneficial in ties with South Africa, while respecting all treaties and obligations on persons and related matters. Crucially, sustained job creation particularly for youths at home and positive image-building abroad would enhance the respectability of Nigerians in the Diasporas and indeed address the negative way the world sees us as people and a nation. Furthermore, our government at home must understand the relationship between poverty, irregular migration and the overall issues of xenophobia, which is not new in South Africa. Nigeria’s relevance within the global system depends on relative strength and control at the domestic level and our continued relevance within the Africa continent and indeed the changing world. Against this backdrop, Nigeria’s international communication and reputational image-building mechanisms must be hinged on diplomatic caution and decency to safeguard our nationals wherever they are in the globe, beyond the xenophobic realities in South Africa. In addition, the African union (AU) has to be alive to its continental responsibility for the emancipation of Africans from the clutches of poverty, walking the talk of development for its people across the continent. Nigeria’s international engagement strategy should be done with diplomatic finesse and dexterity and pragmatic efforts should be made to improve on our foreign relations mechanisms, particularly on the issues of cross-border migration. Nigeria should desire to play by the rule of international obligations in spite of its visible failings at home in providing basic social welfare and essential services for majority of its people who live on less than one dollar a day. The challenge of xenophobic attacks again is wake up call for the Nigerian government to organise its affairs by improving living conditions at home, as well as strengthening its foreign policy objectives. Alan, Greenspan. (2007). The Age of Turbulence, New York. Bond, P. (2000). Elite Transition from Apartheid to Neoliberalism in South Africa, London: Pluto Press. Eze, Osita (1984). Human Rights in Africa. Henkin, (1974). How Nations Behave. Klein, Naomi. (2007). The Shock Doctrine. The Rise of Disaster Capitalism. (London, the Penguin Group, 2007). Krugman, J., (1999). The Return of Depression Economy, New York: Norton. Morgentheu, Hans, J. (1948 – 1996). Politics among Nations: The Struggle for Power and Peace, 4th Rev. New York: Knopf. Obiozor, G. A. (1998). Power Principle and Pragmatism in International Politics, Institute of International Affairs, Lagos, March. Richmond, A. (1994). Global Apartheid. Oxford: Oxford University Press. Rodney, W. (1982). How Europe Underdeveloped Africa, Benin. Publishing Company. Sagay, Itse, (1981). Racial Discrimination in International Law.